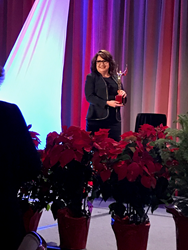 The Santana Group congratulates Founder and CEO, Rosa Santana for her induction into the Women’s Business Enterprise Hall of Fame on November 29th in Dallas, Texas. Under Santana’s leadership, the Santana Group provides innovative outsourcing solutions to organizations across all industries. Rosa Santana was among 10 women entrepreneurs and advocates inducted during a ceremony presented by the American Institute of Diversity & Commerce. Honorees from around the country were applauded for excellence in entrepreneurship, leadership and mentorship.